TechPowerUp found press shots of the watercooling kit that will be bundled with some of Intel's upcoming Core i7-3000 series processors. These Sandy Bridge-E series are expected to arrive on November 14th. They have gone with Asetek due to their high quality products and good reputation, which will be branded with the distinctive Intel blue logos. 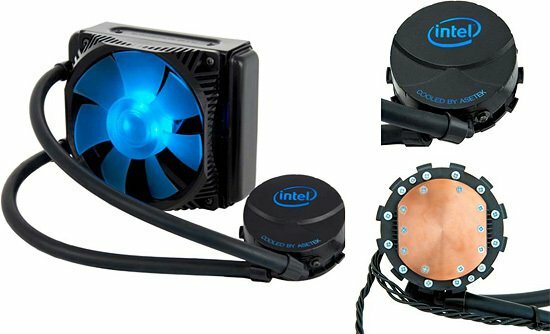 The 12cm radiator fan will actually be illuminated in Intel Blue, giving a classy look to the kit. On top of that, they will actually sell the kit separately, so no one need feel left out. The E-series chips are already significantly faster than the current Sandy Bridge offerings, but water cooling will be able to stretch that lead even further and should make for some exciting overclocking achievements.